The Changing of the Guard is a formal ceremony in which the New Guard publically takes over the responsibilities of the Old Guard. 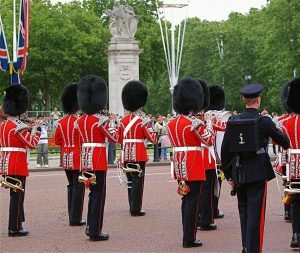 Best known for their bearskin hats and stern demeanor, The Queen’s Guard can be spotted marching through the Buckingham Palace grounds in perfect unison. The Guard consists of British soldiers, selected to safeguard the official royal residences. Horse guards and foot guards have been responsible for defending the Sovereign’s palaces since the reign of King Charles II. The Changing of the Guard, or the Guard Mounting, is a formal ceremony in which the New Guard publically takes over the responsibilities of the Old Guard. The ceremony takes place every other day at Buckingham Palace in London. It begins promptly at 10:45 am, with the handover taking place at 11 am sharp. The Regimental Band or Corps of Drums provides musical support during the ceremony. The ceremony is free to the public, although it’s recommended that visitors arrive early to secure a good viewing spot. London tourists are encouraged to check the online schedule of the Guard Mounting, as the ceremony is canceled when large events are held in the city center. The Changing of the Guard does not run daily. Please click here for a comprehensive schedule of the ceremony. Every Summer, tourists are invited to visit Buckingham Palace. Witness the famous Changing of the Guard, then spend the day exploring the grounds and interior of the Queen’s official residence. Tour one of the world’s few remaining royal palaces. View the exceptional collection of paintings, sculpture, and fine English furniture. In 2018, the special exhibition celebrates the 70th birthday of Charles, Prince of Whales. AESU offers several trips to London and the UK, including Cosmopolitan, Euro Spree, Explorer, Euro Focus, and our most popular tour, Great Escape. Explore England and the home of William Shakespeare. This entry was posted on Wednesday, November 15th, 2017	at 11:13 am	. You can follow any responses to this entry through the RSS 2.0	feed. Both comments and pings are currently closed.